Yeast is a fungus that is responsible for turning sugar into alcohol and carbon dioxide. In baking, it is responsible for providing leavening to dough by filling up and expanding the gluten structure of dough with gas. Yeast becomes active when it is combined with liquid and has the opportunity to feed on sugar. For this reason, the easiest way to know if your yeast is still alive is to first “proof” it by combining it with warm water and a pinch of sugar, then leaving it covered for approximately 10 minutes. If the liquid starts to foam and bubble, the yeast is active. A basic yeast dough consists of yeast, sugar, water, eggs, flour, butter, and salt. 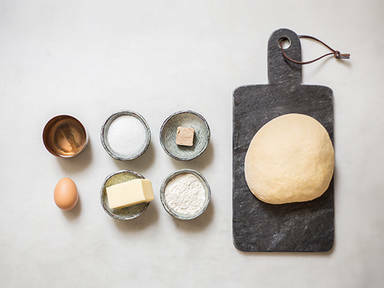 These elements are combined to form a dough, which then needs to be kneaded to develop the gluten structure and left to rise and ferment in a warm place until about double in size. Depending on the dough you are making, it is possible that it will need to rise more than once for the desired effect. The process of fermentation is what ultimately develops flavor and structure in the dough. And though it is a scientific process, it is rather straightforward to execute—all you need is a bit of patience!